So where will the next exit come from? We all know that Israel is the state of start-up. But where do they really come up with innovations and inventions? Well, oddly enough, these are in the academia and research institutes. About two years ago we started working with a company called SN2E. They are commercializing intellectual property - technology transfer. What does it mean and why does such a company need branding? The State of Israel is full of colleges, research institutes and universities in which groundbreaking initiatives and technological developments come to live and affect all aspects of our lives - health, security, economics and more. But what the majority of the public does not know is that the connection between academia and industry requires specialization and mediation, which is usually managed through the commercialization of intellectual property. Imagine an energetic, brilliant and ambitious student who has developed an invention of commercial value. Everyone is excited; Mother is proud, Dad tells the guys, the professor takes credit and what's next? What now? Could the student sell his invention tomorrow morning? Maybe start a company and develop it? In whose name is the invention registered? Who are the rights? Well friends - it's not that simple. Intellectual property commercialization is a whole world. Both in industry and certainly in academia. So for those who do not know the term “ Technology Transfer “- this is the process of commercializing the intellectual property of any invention or patent with commercial potential. Every university in the world has a technology transfer office through which the university commercializes the intellectual property developed in its books. SNE bridge between the academia and the industry. Academia in Israel is relevant to every field that you can imagine - textiles, medicine, industry, biochemistry, marine biology and more. The subject is complex and interesting, since the rights are not those of the inventor or the researcher alone, and in each institution there are arrangements and agreements between the students and the institution regarding the intellectual property rights (by the way the patent itself, if it is registered, will always be in the name of the inventor / researcher). SN2E is a commercial company that provides management and commercialization of intellectual property services for all Israeli colleges, research institutes and hospitals. SN2E was chosen three years ago by the Council for Higher Education to manage the intellectual property of more than forty government institutions, and there is a lot of action there: academia in Israel is relevant to every field that you only imagine - textiles, medicine, industry, biochemistry, marine biology and what not .... really endless fields and inventions. So what are they doing in SN2E? They bridge between the academia to industry. 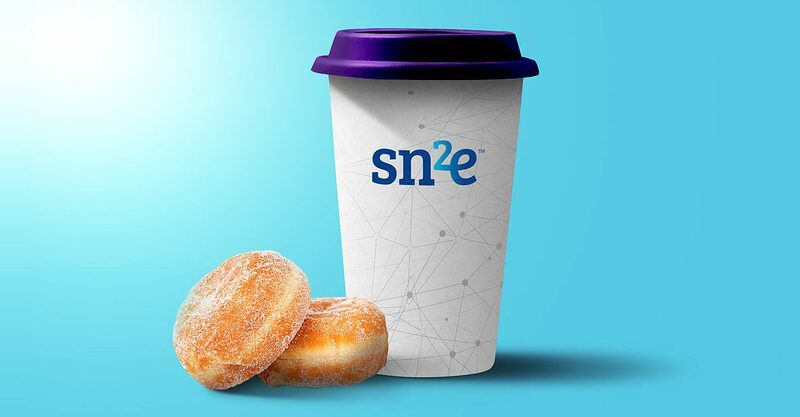 SN2E examines thousands of inventions and new products that are developed in the academia, assesses their business potential (if any) and manages the whole process of commercialization, up to the acquisition. This is a long and complicated process that requires expertise in many areas of research, understanding of the world of patents and intellectual property and requires sales expertise. So what do we have to do with it? Well, we were asked to brand a company that deals with a field that is not in the public consciousness, usually managed within the walls of academia, but in the end it sells products like any other company. It sells intellectual property.In a joint strategic process with an American team (SN2E sells its intellectual property worldwide), we developed the company’s messaging, created a new visual identity and set up a new site for SN2E. The process was interesting and challenging - on the one hand, SN2E’s clients are the academic institutions - they should be given a place, appropriate representation and relevant content. On the other hand, there are potential investors - they want to know about each invention, who developed it, what its commercial potential, and more. At the end of the strategic process, we approached the development of the company's visibility. The new design language conveys the brand's values: expertise, dynamism, future progress and simplicity. The new visual branding uses a clean typographic language that is expressed in the design of the logo, combined with technological images and the visual of a bridge that symbolizes the brand's strength and robustness and the connection between the academic world and the world of technology entrepreneurs and inventors. See the end result of this impressive project.